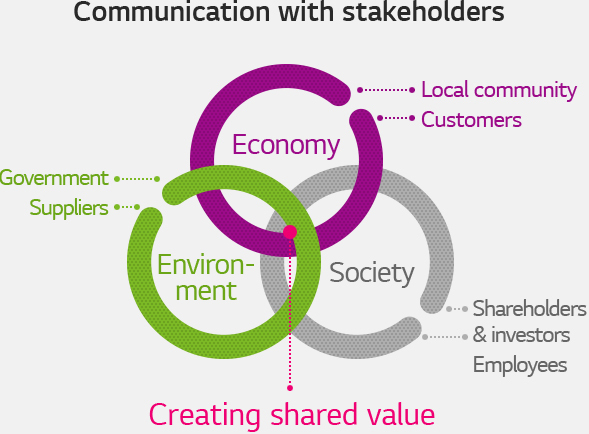 Under the growing social responsibilities required to the companies and the growing instabilities of the external environment, LG U+ believes the importance of stakeholder communication. LG U+ is thereby doing its best to constantly communicate with key stakeholders divided into shareholders, customers, employees, suppliers, local communities and the government.LG U+ exerts itself to provide the suitable information based on the feedbacks from the stakeholders. We distribute financial earnings to shareholders and investors, create stable profits and endeavor to become a successful long-term partner. We provide differentiated products and services, strive to improve customer service through collecting customers’ opinions, and make efforts to strictly protect customers’ privacy. We create healthy labor-management relationship and energetic working environment, make constant efforts to share vision and performance with the employees. We also provide satisfactory welfare system, performance-based remuneration to maximize employee satisfaction. We make transactions under fair contract terms and share performance with partner firms. We also strive for mutual growth through R&D cooperation. We contribute to solving local community issues through diverse social contribution activities that reflect business characteristics. We also help the disadvantaged and strive to make heartwarming community culture. We actively participate in round-table meetings and state-funded projects. We also comply with regulations and laws, faithfully pay tax and create indirect economic achievements. The sustainability of partnering companies is key to enhancing overall competitiveness and accomplishing qualitative progress. LG U+ has established a comprehensive system and procedures to support its partnering companies. The entire company exerts itself to establish a business ecosystem in which the strengthened capabilities of the partners exist in a virtuous cycle with LG U+’ to achieve competitiveness in service and cost. LG U+ endeavors to create the virtuous cycle of LG U+ developing the capabilities of the partner companies and partner companies raising the competitiveness of LG U+ in return. LG U+ also established an electronic purchasing system to prevent unfair transactions and always practices 5 principles for transparent transaction. LG U+ is committed to closely cooperating and accomplishing mutual growth with the partner companies. Therefore, LG U+ is providing various programs to the partner companies. Firstly, we offer various support measures in finance, technology, education and purchase sectors. LG U+ strives to grow together with the partner companies by supporting the partner companies’ CSR internalization in a long-term basis and by providing resources to help them secure their own growth engine. LG U+ has set ’ reating true earnings by establishing and running a top-class customer center’ ’ ustomer first management’ and ’ chieving top-class operation efficiency through continuous improvement practices’ as a mission for customer value creation. We are constantly trying our best to go beyond satisfying our customers and move their hearts with our services. We shall impress the customers through operating No.1 customer service center. We will create meaningful profits through thoroughly analyzing customer satisfaction factors and dissatisfaction factors and through reducing unnecessary expenses. In October 1st, 2015, LG U+ launched ’ embership for myself’ to increase the convenience of customers. The new changes in the membership have added diverse new service benefits to customers while keeping the previous ones. Moreover, customers can choose categories of their interest such as movie, food and transportation and enjoy differentiated services of their choice. LG U+ runs customer product experience programs for employees and its own customers to develop customer-friendly services and to improve the quality of services. Following the 2014 customer product experience programs in which 740 people have experienced 244 assignments of 17 services, 946 people have experienced 325 assignments of 15 services in 2015, contributing to improvement in services.